Two years ago Cory Sheldon created and posted this animated short film on Vimeo. It's specifically about the legacy of unexploded ordinance (UXO) that remain in Laos since the Vietnam War. The remaining bombs have become virtual landmines to villages across the country. The film is a sombre reminder of the situation, but it remains an important one nonetheless. Have a look. Laos Free from Cory Sheldon on Vimeo. Xaysomboun province is set to officially open to tourists at the end of this year, allowing visitors the chance to explore some unknown and untouched sites in this formerly secret area that was for a long time closed to all outsiders. Both historic sites and natural beauty are among the many attractions in the formerly remote Xaysomboun province. The start of Visit Xaysomboun Year will be officially marked in December, aiming to coincide with the anniversary of the establishment of the province, which was officially founded in 2013. A short Lao documentary discussing the importance of nature, forests and farming and the community's dependency on the land, with a focus on Xiengkhoung province in Laos. Posted by Youtube User XYZPuna. This is a very interesting documentary on some of the members of the Lao-Australian community sharing their stories from their experience. It's a documentary that Lao expats from around the world can probably relate to. Posted by: Youtube user Talatsao. Even in Laos, most people know that the city of Luangprabang is considered one of the favoured cities to visit during this time of the year. And if that wasn't enough, did you know there's a Lao New Year song just for this city? Check it out below. 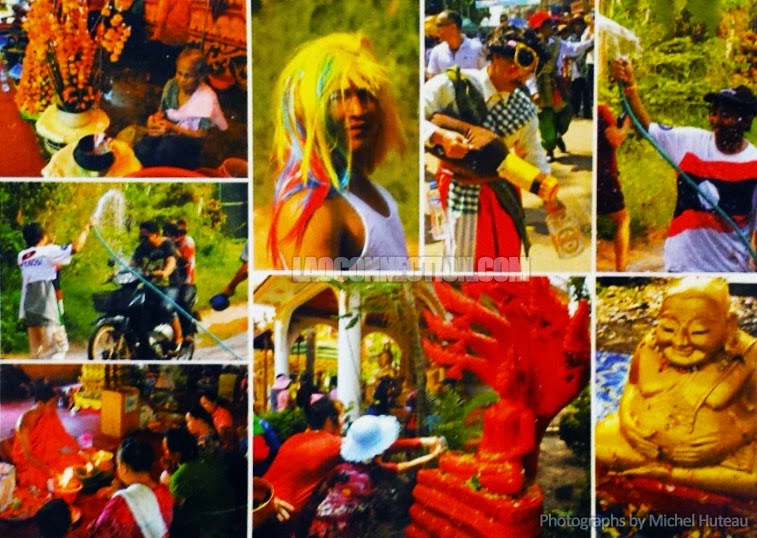 Here are just some of the fun, revelry, shennigans and ceremonies that occur during Lao New Year, as shown here in this montage of photos. 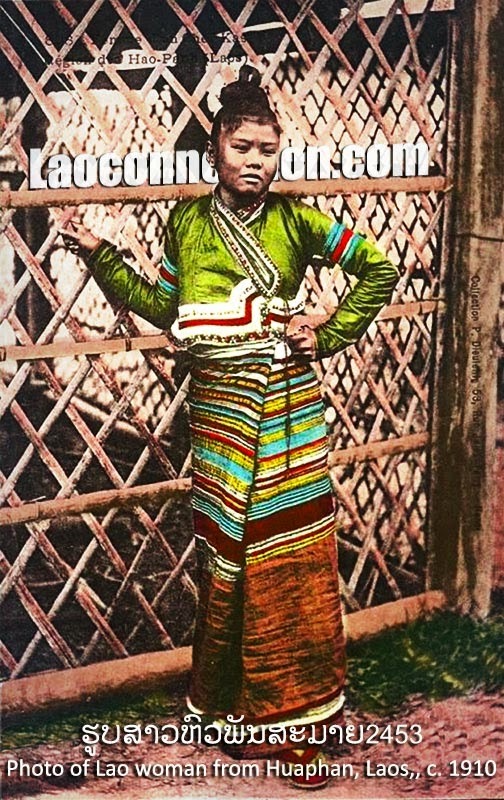 This photo is from an old French postcard from 1910 showing a Lao woman from Huaphan, Laos. Photographer Credit: Unknown. Colorization by Laoconnection.com. 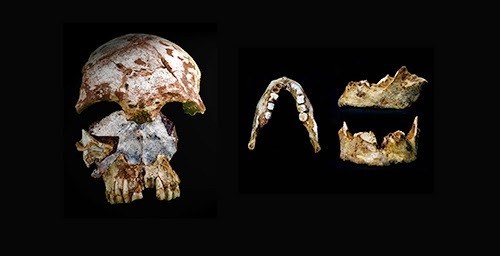 An ancient human skull and a jawbone found a few meters away in a cave in northern Laos add to the evidence that early modern humans were physically quite diverse, researchers report in PLOS ONE. Get ready because it's that time of year again! 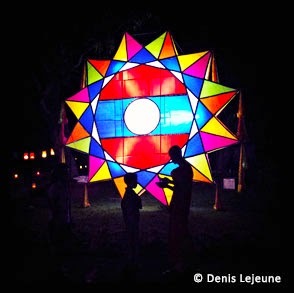 With April comes Lao New Year 2558. Official days: April 14-16, 2015. 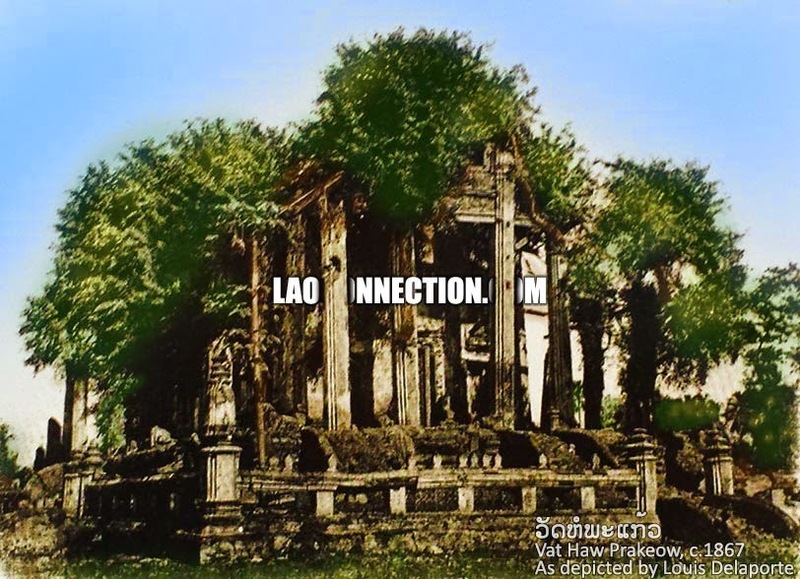 This is what the famed Vat Haw Prakeow (ວັດຫໍພະແກ້ວ) in Vientiane appeared as when it was "re-discovered" by a French expedition to Vientiane, circa 1867. Image Credit: Engraving by Louis Delaporte, c.1867. Colorization by Laoconnection.com. As drones become more commonplace, many companies are developing innovative uses of the technology beyond that of commercial and novelty robotics. In his SXSW Interactive talk on humanitarian drone use cases this weekend Ryan Baker, CEO of aerial imaging firm Arch Aerial, discussed his company’s hopes to deploy its drones to map out mine fields and locations littered with unexploded bombs from historical warfare. Baker suggested that his company wants to start the programme in Laos, the world’s most heavily bombed country – during the Vietnam War, the nation was targeted in over half a million American campaigns which dropped over two million tonnes of bombs across Laos. Laotians are still suffering the effects of a land riddled with landmines and unexploded cluster bombs. Ten of Laos’ 18 provinces have been labelled “severely contaminated”, with ‘tennis ball-size’ cluster bombs being the biggest threat. Laos will raise the minimum wage for unskilled labourers by almost 50% in a move reflecting the government's concern about a worker shortage. The monthly wage will rise to 900,000 kip (about 3,630 baht) in April, a 43.8% increase from the current 626,000 kip (about 2,250 baht). "The wage adjustment will take effect on April 1, 2015," the offical Lao News Agency quoted Phongsaysack Inthalath, director-general of the Labour Management Department, as saying Wednesday.